Here’s a selection of campaign items of candidates whose last name begins with an “A.” Does anyone know these folks are? The Queens County Republican Committee has designated Sunday, June 28th, as Ashmead-Garing Day in honor of the Republican leader and co-leader respectively. Miss Lillian Garing lives on Chicago Avenue. are proud to have such a woman in our midst. And for James J. Abbate, look to the April 24, 1935 page 18 of “The Herald Statesman“. Mr. Abbate was the former supervisor of the Yonkers’ 10th ward by the time they had this dinner for him (second column, 3rd para from the bottom). Looks like FultonHistory.com is a useful site for these buttons… did you get them all in the NY area? Frank Andrews sought the Democratic nomination for governor of New Mexico in 1986. He had a couple of paragraphs on the front page of the Patterson NJ “The Messenger” on February 22, 1940. I believe the Anderson/Wilson pinback is from NY. Warren M. Anderson served under Malcolm Wilson as acting Lt. Governor of NY after the resignation of Rockefeller and perennial Lt. Governor under Rockefeller Wilson’s elevation to Governor in 1973-74. Subsequently, he sought the Republican nomination for NY Governor but lost it to Perry B. Duryea at the convention. Believe the Anderson/Wilson pin is from that attempt. If my memory serves me correctly, Anderson would have been considered the stronger candidate for Governor than Wilson due to his stronger and more varied previous political experience. All of which would make sense for a Anderson for Governor and Wilson for Lt. Governor pinback. The Adams for Congress pinback may be from MIchigan. Paul L(for Lincoln) Adams ran for Congress for the 11th district in 1942. I found no record of his Conservative Party namesake from NY, Paul L Adams, having run for Congress. It also looks like a 1942 era pin. 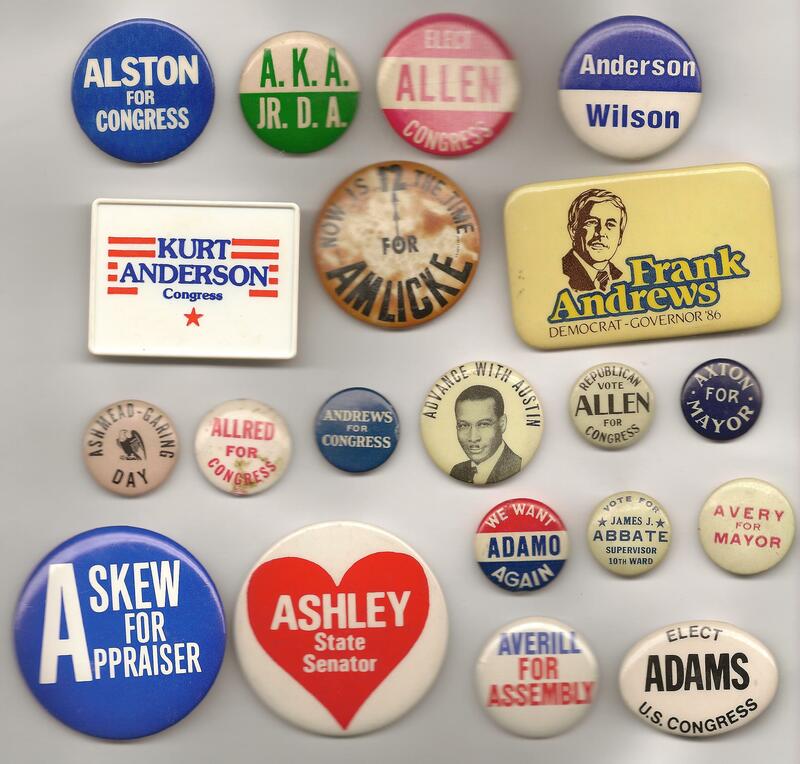 Bill, this Anderson/Wilson button came out well after Malcolm Wilson’s 1974 run for governor, his last campaign. I agree Ken. Doesn’t my sentence “Subsequently, he……convention” imply that?